The excavation started as planned on the 22nd June. 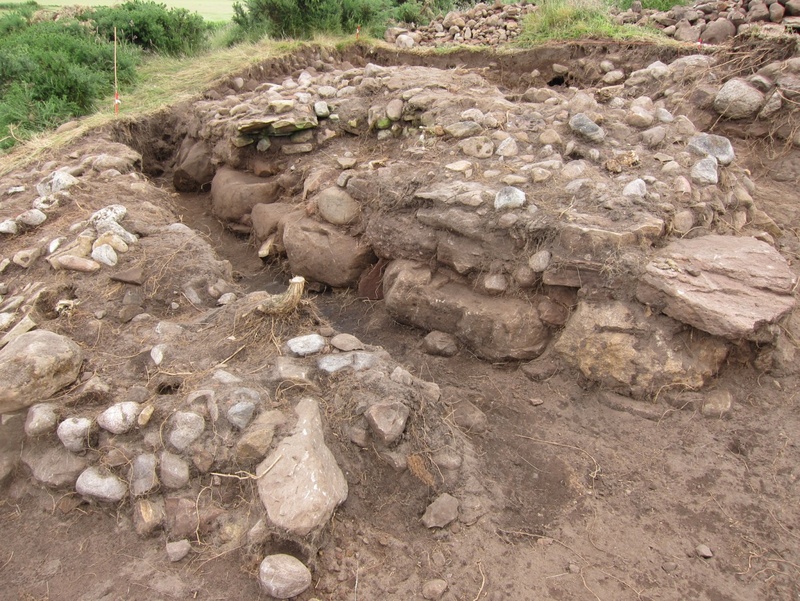 A 15m long trench and 10m wide was opened over the northern part of the dun. It took 2 days to open up the area (gorse removal and grass) and as the surrounding field was under crop, a JCB was not able to access the site and speed up the opening. 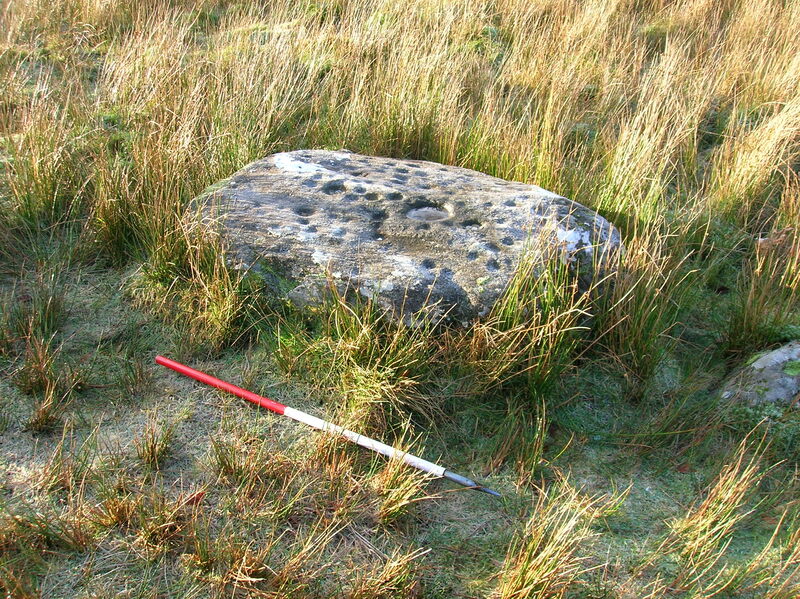 It soon became apparent that the site has been largely robbed of stones, likely during the 19th – 20th Century, possibly to make the enclosure which sits on top of the dun. The quarry holes can still be seen. It was a hard task to plan and remove this later enclosure, mainly due to the amount of rubble and the fact that the enclosure was little more than tossed up earth and stone bank (we can firmly assume that this is not the Castle Corbet) and blended in with the dun itself. Picture showing the surviving outer dun wall. The rubble to the left is a collapse which hid this outer wall face. In the trench the outer dun wall face was harder to find than we expected and is it due to the large amount of collapse from the dun wall core outwards and collapse from the enclosure on top of it as well. It was towards the end of week 2 when we finally figured out where the outer dun wall was located and which made the site nicer and easier to understand. The dun wall turned out to be a complex construction with multiple stages of construction now visible. Initially it seems to have started out as a round house with about 1.5m thick wall. Up against this wall, additional 2.5m of extra wall was added, making the wall about 4m thick. This entry was posted in Excavations, Iron Age, Tarbat and Easter Ross and tagged Archaeological dig, archaeology, archaeology Scotland, Cnoc Tigh, Excavation, Iron Age Dun, Iron Age Round House, North of Scotland Archaeological Society, NOSAS, Pictish, picts, Portmohomack, recording and surveying, Scottish archaeology, Tarbat on July 27, 2014 by nosas. In the autumn of 2012, Jean and I were asked, because of our experience in survey and archaeology, to join Elizabeth and Allan MacDonald and half a dozen others from Arisaig, about twelve miles north of where we live, in order to do a walkover survey of the Rhu Peninsula, a virtually- deserted five by three miles stretch of very rough ground immediately south of Arisaig. Many people will know this area by the winding coastal road that runs along the north side of the peninsula and round the western tip to the old ferry pier at the end of the public road. Beyond this a track continues for a mile or more to the only two permanently-inhabited houses on Rhu. The ferry to the Small Isles berthed here in the days of sail because the way into Arisaig harbour was, and still is, very dangerous, with huge areas of drying reefs. 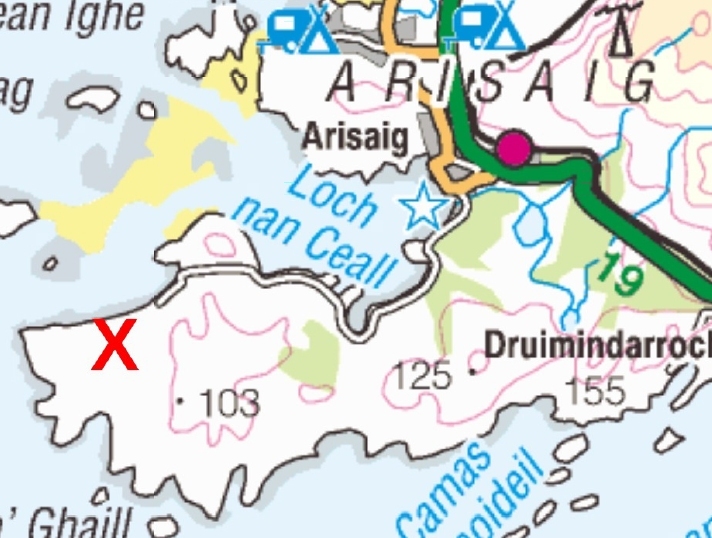 The current 1:25000 OS maps mark only a dozen or so features on Rhu Arisaig. In January 2014, as the survey restarted, we had over three hundred on the list, mostly townships, shielings, feannagan, cairns, enclosure walls and the like. But there is relatively little of real note on the peninsula, probably because until very recently it was too inaccessible even for the Antiquarians, with the one exception of the Reverend Jolly, who specialised in looking for cup-marked stones on his days off, and in 1885 very accurately recorded one of the very few west coast examples at Gaodeil, on the eastern border of our survey area. This entry was posted in General Archaeology, Lochaber, Neolithic and tagged an Garbh Criochan, archaeology, archaeology Scotland, arisaig, incised stone, neolithic archaeology, North of Scotland Archaeological Society, NOSAS, RCAHMS, rhu peninsula, rock art, Scottish archaeology on July 15, 2014 by nosas. Keppoch is a cleared village near Dundonnell in Wester Ross (NH 09519 88665). I have a visited a few such settlements before but it did not take long to realise that Keppoch was something special. This was partly the situation; overlooking as it does the wide valley floor of Strath Beag near the entrance to Little Loch Broom, with the snowy shoulders of An Teallach looming on the horizon. However the number and extent of the buildings easily identifiable was the real draw. Also poignancy was provided by the historical information we had, largely complied by Cathy Dagg, which showed that the settlement had been apparently cleared of its tenants between the 1820’s and 40’s. Only four households were listed as remaining in the 1841 census; a weaver, a carpenter, a fisher and a cotter. 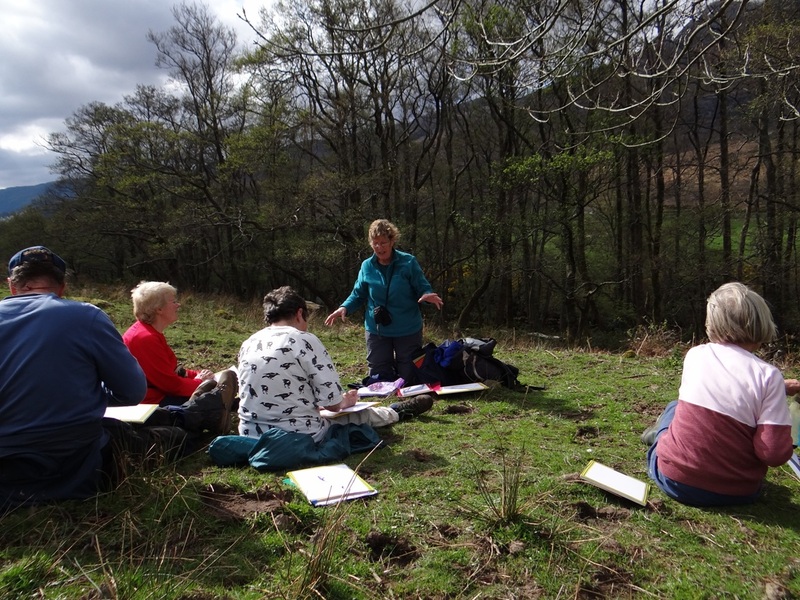 Anne MacInnes (who originally suggested the site), Meryl Marshall and Beth Blackburn between them had organised a four day programme running across the last weekend of April. Friday and Saturday would be taken up with clearing the site, whilst Sunday would be the meat of recording and drawing the features. Monday was reserved for a trip out to another nearby cleared village at Glenarigolach. I did not manage to make it down until Saturday lunchtime and by this point clearing operations were well under way with a few newly discovered buildings being added to Meryl’s original drawing. The afternoon was spent disposing of the remaining brambles and gorse, and was finished with a tour of the village during which each building had numbers attached for easy identification the following day. After this everybody was more than happy to get washed and changed before reconvening for a very pleasant meal at the Aultbea Hotel. Meryl Marshall had prepared a fearsomely comprehensive information booklet for the weekend. This had been emailed to all the attendees with stern warnings to thoroughly digest the contents prior to Sunday. 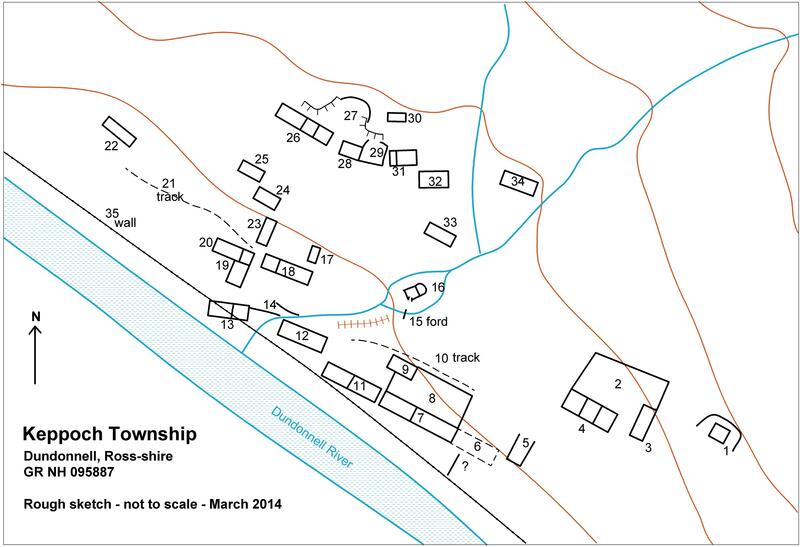 Meryl had actually done a fantastic job of producing a simple but effective guide to recording and surveying a township, including handy “top tips” (the whole manual can be accessed at here and is well worth checking out). It informed us that standard of information to be collected could range from a “one star” up to a “five star” treatment. We were to give Keppoch a four star treatment, which would involve a full written description, photos and a dimensioned sketch of each building. This entry was posted in General Archaeology, Post Medieval, Surveying and Recording, Wester Ross and tagged 1841 census, archaeology, archaeology highlands, archaeology Scotland, archaeology Wester Ross, aultbea, bloomery, cleared village, corn kiln, dimensioned sketch, drawing a building, Dundonnell, glenarigolach, highland archaeology, Highland clearances, Keppoch, Little Loch Broom, North of Scotland Archaeological Society, NOSAS, Post Medieval archaeology, recording a building, recording and surveying, Scottish archaeology, surveying a village, tape and offset, twinning pen, writing a site description on July 15, 2014 by nosas.